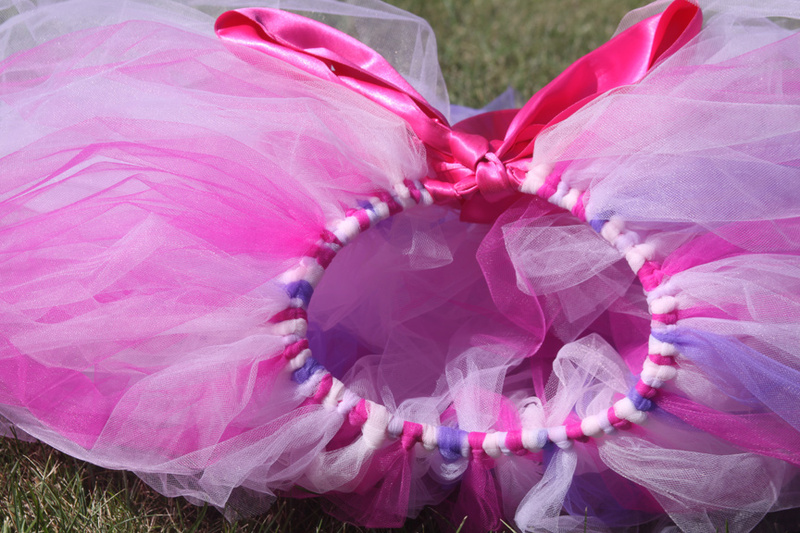 Making a little girls tutu is a quick and easy project that will thrill any little princess! 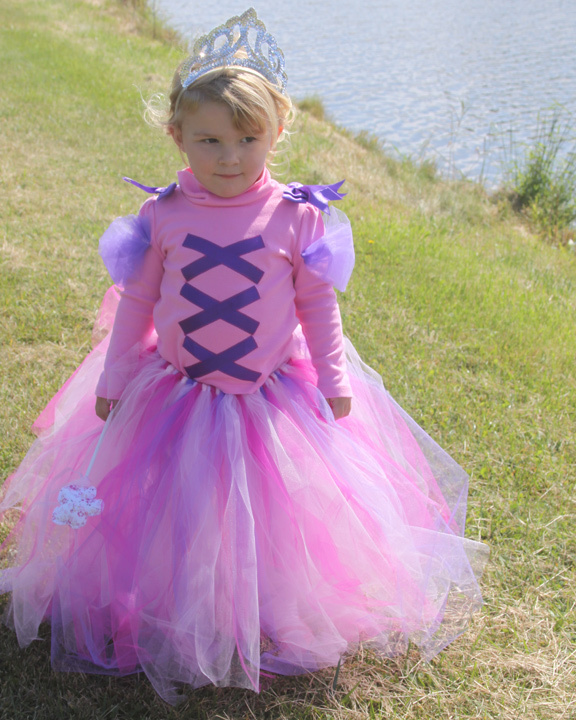 I made this tutu to go with my daughter’s Rapunzel Halloween costume, but I know she will be wearing it all year round. Here is how you can easily make one during one short nap time! To make a tutu you only need a few things. These directions are how to make a floor length tutu for a 2-4 year old. I purchased 3 rolls of tulle in hot pink, pale pink, and a light lavender. They were 6in by 25 yard rolls that I found in the wedding section. These were about $2.50 each. I also wanted some dark purple in the tutu but couldn’t find the right color in a roll. I bought two yards of dark purple tulle and cut it myself. I think 3 rolls would be plenty for this – my daughter wears about a 3T pants size right now and this amount was perfect. I started by getting tulle cut. 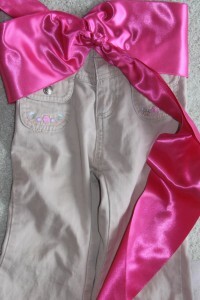 To make cutting tulle a quick and easy step I measured my daughters pants length. Next I cut a stiff piece of cardboard to that length.I wrap all of the tulle around my measured cardboard, and then cut it all at once. This keeps the lengths consistent, and eliminates having to measure every single piece. Very quick and easy. Notice that I only cut at the bottom of the cardboard. 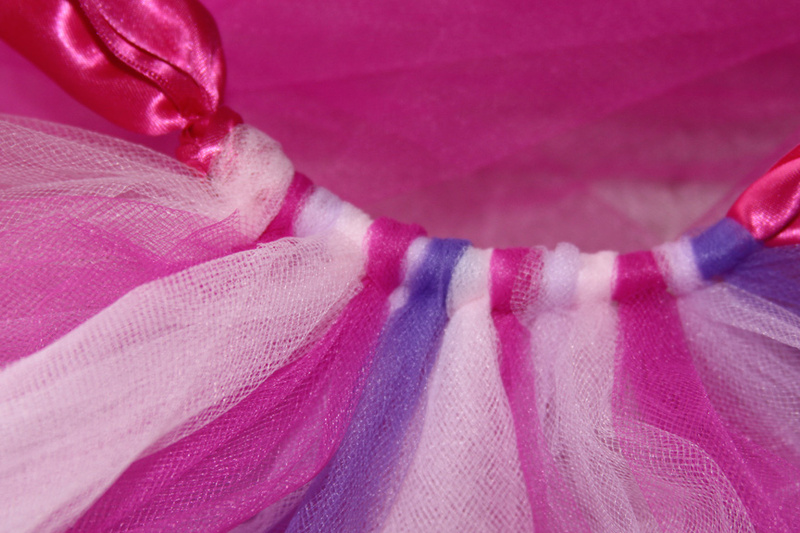 You are going to loop these lengths of tulle to create your tutu – so the length you have now is doubled from the measurement that you took from the pants. Next you will need to cut a piece of ribbon long enough to go around your child’s waist and long enough to tie a bow. 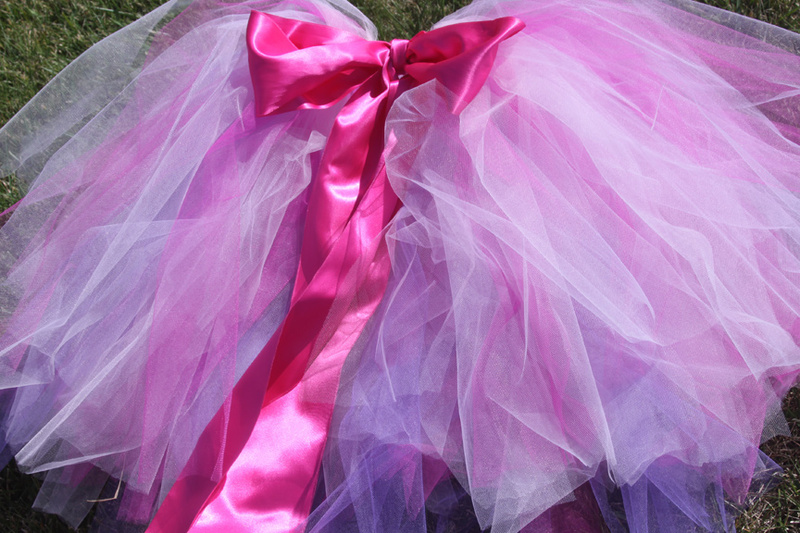 I used a sash in this case because I found it on clearance – I love how the big beautiful bow looks with the tutu. It makes it a little extra fancy! I used the 3T pants and put the center of my ribbon at the middle back of the pants. Wrap the ribbon around the pans so the meet in the middle front of the pants. Tie knots on each side where they meet. You now have the waist of your tutu. 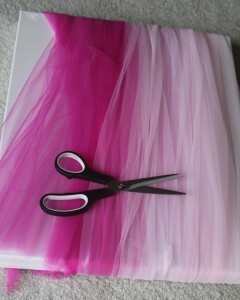 You know have a pile of tulle and a ribbon to attach them to. 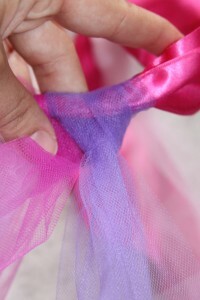 The last step is to attach the tulle to your ribbon that you have measured and knotted for your waist. This is the fun part. Now is the time to decide what pattern you would like your colors to be in. I alternated mine: light pink, light lavender, hot pink, light pink, light lavender, hot pink, dark purple and repeated until I was done. Note: I had to buy 2 yards of the dark purple from a bolt and cut it myself (I need this color to match the shirt for my daughter’s Halloween costume). The only reason I didn’t alternate this the same as the others is because I didn’t have as much. To make your pattern easier – just alternate what you have! 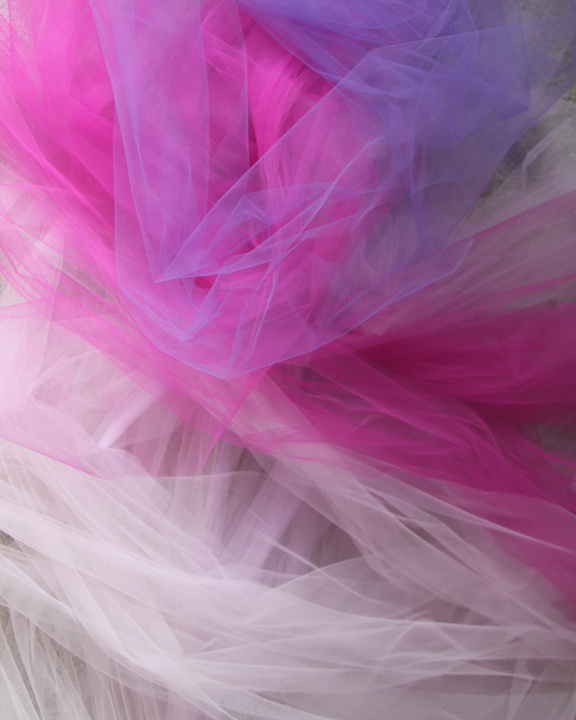 I sorted my pretty pile of tulle into color piles and was ready to start making the tutu. Take one piece of tulle and grab it directly in the middle of the strip. 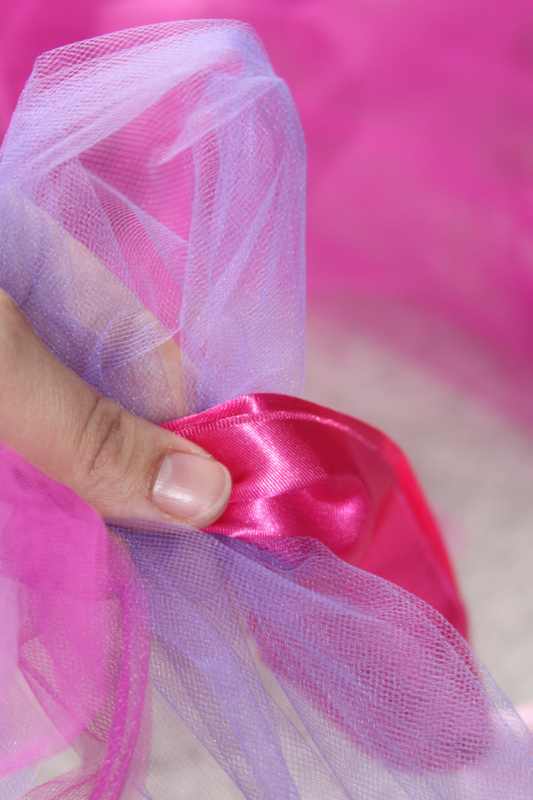 Grab your waist sized ribbon to attach your tulle. Make a little loop with the center of your tulle and place a couple inches above the ribbon. Pull the two ends of your tulle through the loop and tighten to create a knot with the tulle (your waist ribbon should be in the center f the knot). Now it is time to practice those knots a few times! Repeat until you have filled in the entire length of ribbon between the two knots that you created. You can make this as full as you would like. Push the knots of tulle very close together to make it more full or spread them apart to thin. 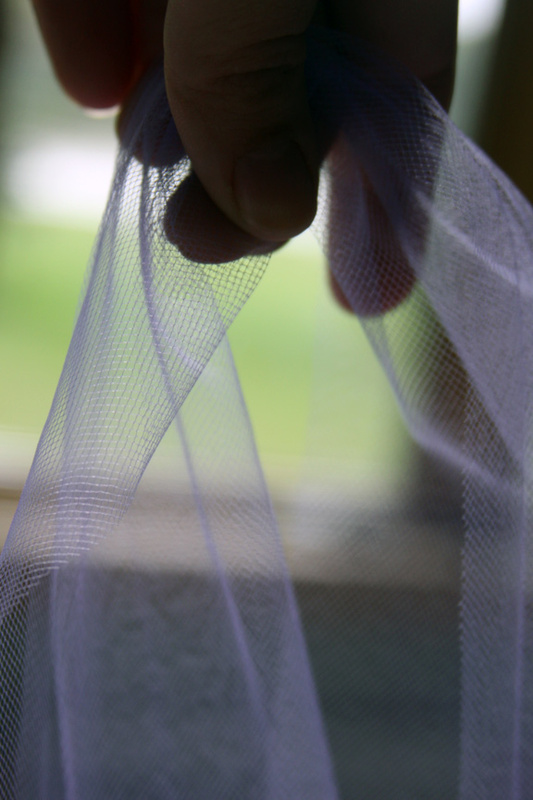 These are a little forgiving if you are running low on tulle – you can spread them apart a bit. This is what your finished tutu should look like. When you are to the end try the tutu on your child and adjust in needed. I want one for myself. 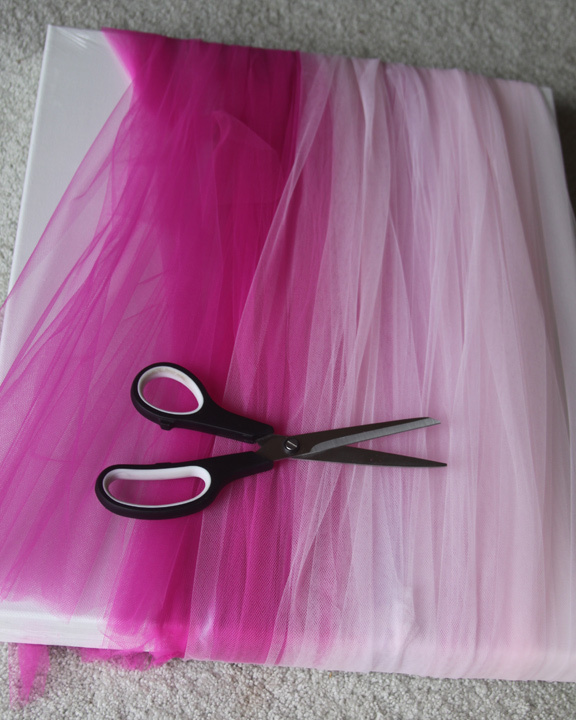 I could see this being part of a birthday party too, making tutu skirts for the birthday guests. So cute! That would be so adorable – imagine the bliss of a group of little girls running around in them – magical! Brilliant! This is so simple I feel ashamed that I didn’t think of it before! Thank you for showing this!